A dynamic centreman, a power-play quarterback, a top-pairing defenceman, a top-line left-winger. The rebuilding Canucks have many needs. 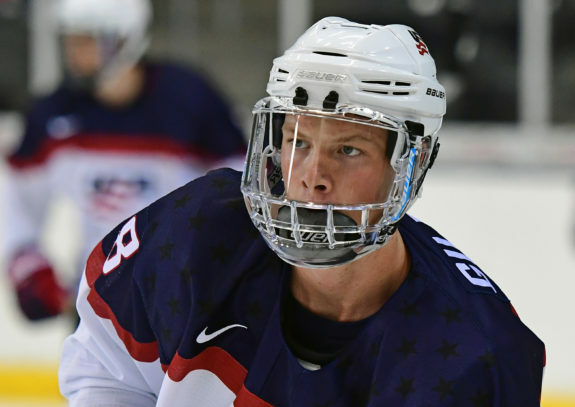 How many of those needs will they be able to satisfy in the 2017 NHL Entry Draft? In my last article, I chose five players who could be a fit for the Canucks at fifth overall, listing four centremen and one defenceman. If the Canucks go the centreman route, they would be wise to select a defenceman with the 33rd overall pick. Even in a wide-open draft, it’s easier to nail down a pick in the top five. Things could really open up in the second round, and there will surely be some surprising selections. Will the Canucks be one of those teams to shock everyone? There’s also a chance the Canucks could package this draft pick in a trade, but let’s assume they keep the pick. Here are my choices for five players the Canucks could select at 33rd overall, from least to most likely. With one defenceman as a possibility at fifth overall in my previous article, I balanced the scales by putting one centreman on this list. The young and raw Filip Chytil is my forward selection for the Canucks here if he’s still available. Just a couple of months ago, Chytil was a third to fourth-round selection. His solid performance for Zlin of the Czech Extraliga has him shooting up draft rankings. He’s now being ranked as a first-round pick in multiple mock drafts. Some lists do still have him as a third round selection. By accounting for the averages, there’s definitely a chance that Chytil is available for the Canucks at 33rd overall. He’s one of the youngest players available in the draft, just missing 2018 eligibility by 10 days. Chytil had the second-most points for U18 players in the Czech league, trailing projected first-round pick Martin Necas. Scouts say he’s above average in all major categories (skating, shooting, puck handling, hockey IQ). This is promising for a young player already facing off against men. There’s a ton of variation with Robin Salo. Some have him as low as a fourth-round pick. Others think he’s better than Miro Heiskanen. Pundits who are high on Salo could have a valid argument. Salo was a top-pairing defender all season long for Sport of SM-Liiga, Finland’s top hockey league. He played on a bad team but showed a defensive responsibility while chipping in one goal and 17 assists in 54 games. Salo isn’t quite as dynamic as Heiskanen on paper, but he does have the ability to be a solid two-way defender at the NHL level. Some don’t see a lot of flash in his game, but he seems to have a higher offensive upside than Urho Vaakanainen, who’s ranked ahead of Salo virtually everywhere. Salo might be a bit of a sleeper since he played on a bad team and didn’t make the World Juniors. He’s a guy the Canucks could shoot for at 33rd overall. Speaking of wild variations, most would think it’s a reach to draft Max Gildon at 33rd overall. One of the reasons to draft him this high is that the lanky defender from Texas has some seriously untapped potential. Gildon has been on the draft radar for a couple of years now, and expectations were high for him entering the 2016-17 season. He was the third-highest scoring defender in the USDP, only trailing David Farrance and Quinn Hughes, but his tepid play hurts his ranking. Scouts say Gildon is inconsistent and sometimes makes poor choices on the ice. If there’s a team who thinks it can coach Gildon through his decision-making, then he could develop into a top-four offensive defenseman with a physical edge. Canucks Army’s pGPS model had similar defenders to Gildon go on to score 35.5 points per 82 games played at the NHL level. He also has tantalizing raw physical tools, standing at 6-foot-3 and 188 pounds. With his size and toolset, I think Gildon is worth reaching for early in the second round. I had the Canucks picking Cody Glass from the Portland Winterhawks in THW’s Mock Draft. 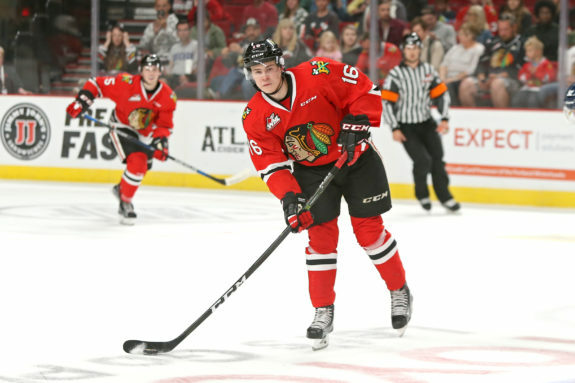 Could his Portland teammate, Henri Jokiharju, join him in the second round? Jokiharju has above-average skating ability, and he analyzes himself as someone who likes to make plays with the puck. He was an offensive catalyst from the back end in Portland, and he improved as the season progressed. Jokiharju is one of a number of Finnish defencemen making waves in this draft class. 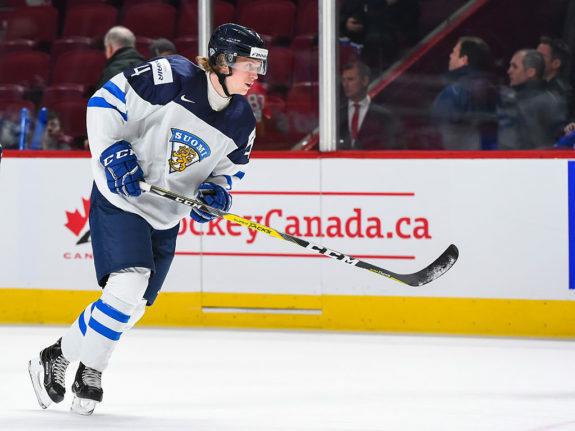 There is always high demand for agile, puck-moving right-handed defencemen, which means Jokiharju could be gone before the Canucks pick at 33rd overall. If he’s still on the board, the Canucks should strongly consider drafting the Finnish defender. He would join Olli Juolevi as another prime Finnish defensive prospect in the Canucks’ system. One of the fastest risers in the draft is my pick for the Canucks at 33rd overall if he’s still on the board. Conor Timmins is probably thrilled at the fact he’s being projected this high since he was ranked on no one’s list coming into the season. 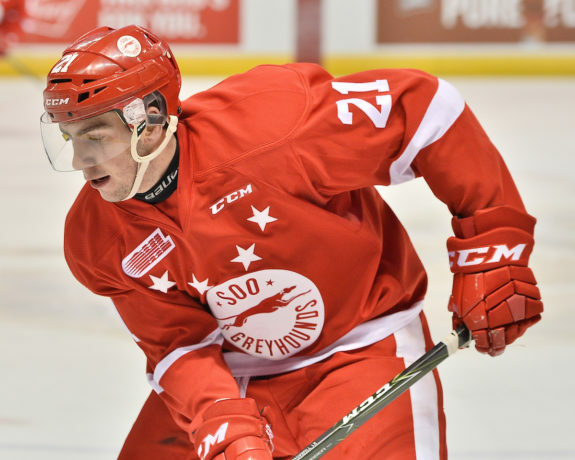 Timmins went from relatively unknown to a leader for the Sault Ste. Marie Greyhounds of the Ontario Hockey League. His offensive game flourished over the course of the season. He finished the season with seven goals and 61 points in 67 games, along with eight points in 11 playoff games. He’s no slouch in his own end either. Scouts praise him for his hockey smarts and his transition game. He doesn’t have many flaws in his game, other than lacking elite, number-one defenceman qualities. Timmins also needs to add strength, like most prospects. His flaws seem like nitpicking more than anything. He’s become one of the fastest-rising prospects in this draft. If he isn’t off the board in the first round, the Canucks need to grab him at 33rd overall.